If you have a pair of anaglyph 3D glasses and want to view a 2D Blu-ray in 3D effect, you could convert 2D Blu-ray to 3D anaglyph movie with the help of 2D Blu-ray to 3D Anaglyph converter. In the post, two converters and their relative method of converting 2D Blu-ray to 3D anaglyph movie are introduced. Leawo Blu-ray Ripper works perfectly to create anaglyph 3D movie from Blu-ray and convert 2D Blu-ray movies to anaglyph 3D movies for playback on your 3D movie players. Leawo Blu-ray Ripper is an easy to use yet professional 2D Blu-ray to 3D video converter that could convert 2D Blu-ray to 3D video in various formats like 3D MP4, 3D MKV, 3D AVI, 3D H.264, 3D FLV, etc. in different 3D movie effects, including: Red/Cyan, Red/Green, Red/Blue, Blue/Yellow, Interleaved, and Side by Side. Have a look at the tutorial below to know how to convert 2D Blu-ray movies to anaglyph 3D videos. Step 1: Free download and install Leawo Blu-ray Ripper on your PC. Note: If you are Mac users and would like to convert Blu-ray to 3D anaglyph on Mac, you should download and install the Mac version – Leawo Blu-ray Ripper for Mac. 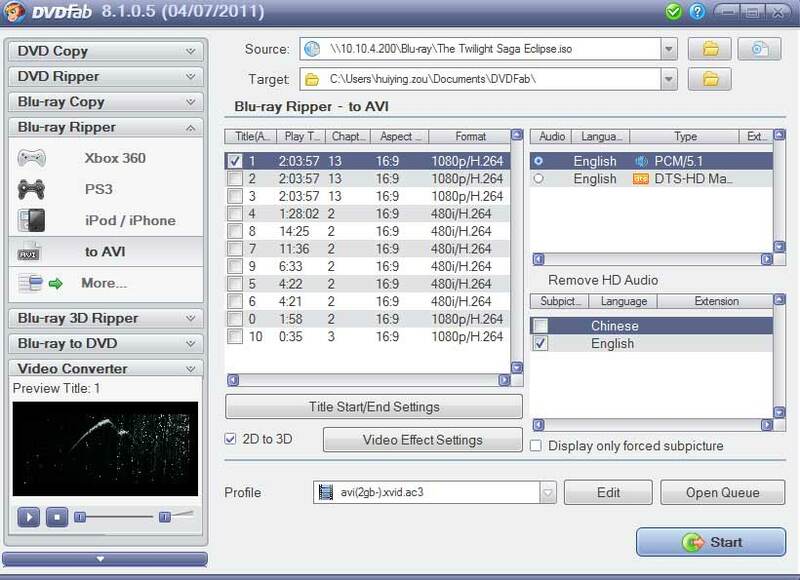 With Leawo Blu-ray Ripper running on, click the "Add Blu-ray/DVD" button on the main interface. This 2D Blu-ray to 3D anaglyph converter would then lead you to browse 2D Blu-ray movies for loading. Note: You could choose to load desired content from source Blu-ray movies by selecting Full Movie, Main Movie or Custom Mode. The 3D setting panel is on the video editing panel, which is accessible after clicking on the "Edit" icon in each loaded Blu-ray title. On the editing panel, open "3D" tab, switch "3D Mode" button to green, and then select "Red/Cyan" option. Adjust the 3D Depth at will. This 2D Blu-ray to Anaglyph 3D converter offers you real-time preview of changes. To convert Blu-ray to 3D anaglyph video, you need to choose a profile as output format. Click the drop-down box ("MP4 Video" by default) next to the "Add Blu-ray/DVD" button and then select select "Change > Format" option to select desired output format like MP4, MKV, AVI, FLV, etc. as output format. For special needs, you could customize the video and audio parameters of output profiles by clicking the "MP4 Video > Edit" option. You could change video codec, audio codec, bit rate, aspect ratio, resolution, frame rate, channel, and other parameters. After setting output profile, you will be returned to the main interface where you need to click the green "Convert" button. Set the "Save to" directoy to save the final anaglyph 3D videos and then click the "Convert" button. This 2D Blu-ray to 3D anaglyph converter will start to convert 2D Blu-ray to 3D anaglyph instantly. Note: If you want to create anaglyph 3D videos out of common 2D videos, you could make use of Leawo Video Converter. DVDFab can act as a 2D Blu-ray to 3D anaglyph converter as well, offering users a solution to convert 2D Blu-ray to 3D videos like anaglyph 3D. Now follow the guide below to learn how to convert and rip Blu-ray to anaglyph 3D video with DVDFab. Run DVDFab on your PC to enter the main interface where you need to pick up Blu-ray Ripper module(If you don’t have it, download and install it on your PC beforehand). Import souce 2D Blu-ray movie by clicking the folder button or disc button next to the source box. When imported, the longest Blu-ray movie title will be selected by default. Choose an output format such as AVI from the Profile list. Check “2D to 3D” button and click “Video Effect Settings” to enter the 3D page where you can choose one mode such as Red/Cyan from preset 14 anaglyph modes. Once done, click “OK” button to return to the main interface. Click “Start” button on the main interface to start to convert 2D Blu-ray to 3D anaglyph. Since both Leawo Blu-ray Ripper and DVDFab Blu-ray Ripper can convert 2D Blu-ray to 3D Anaglyph, it is necessary to figure out the differences between those two programs. Therefore, a comparison chart between Leawo Blu-ray Ripper and DVDFab Blu-ray Ripper is presented below. Detailed video and audio parameters adjustable such as video and audio quality, video and audio codec, resolution, bit rate, frame rate, sample rate, aspect ratio, channel, etc. Through comparision, we know that these two programs have nearly the same features, but DVDFab Blu-ray Ripper charges more. For economical reason, Leawo Blu-ray Ripper is highly recommended.